In support of the Theatre in the Mountains and Loma Prieta Joint School District’s music/art program. Performances will be held on August 27 and 28. Last summer’s “Summit Idols” was a sell out. Cash prizes for the Best Adult soloist, Best Teen soloist, Best Child soloist and Best Group. 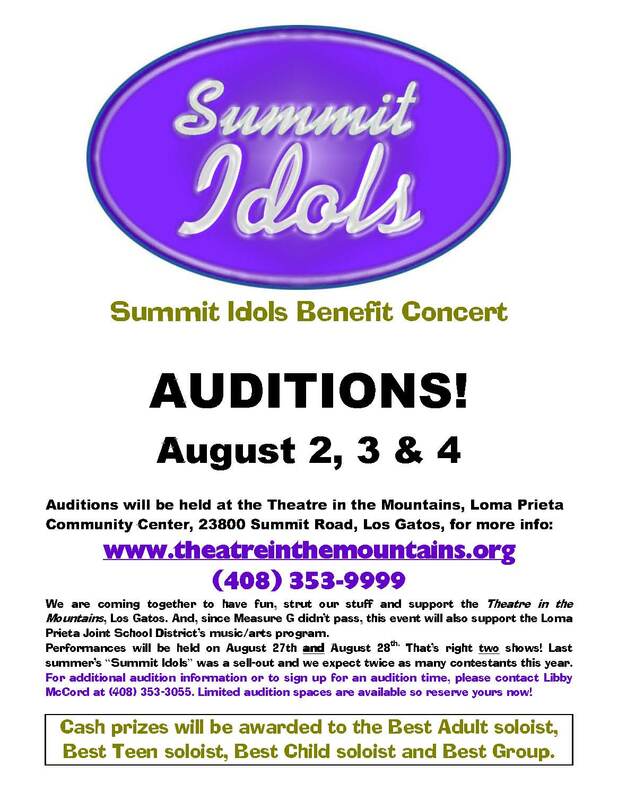 Audition slots are limited, so please call Libby McCord at 408-353-3055 ASAP to schedule your audition appointment! This entry was posted on August 2, 2010 at 9:26 am and is filed under Events. You can follow any responses to this entry through the RSS 2.0 feed. You can leave a response, or trackback from your own site.